George likes to do his own maintenance on his vans and trucks. I bought a used car whose undercarriage was greatly rusted. 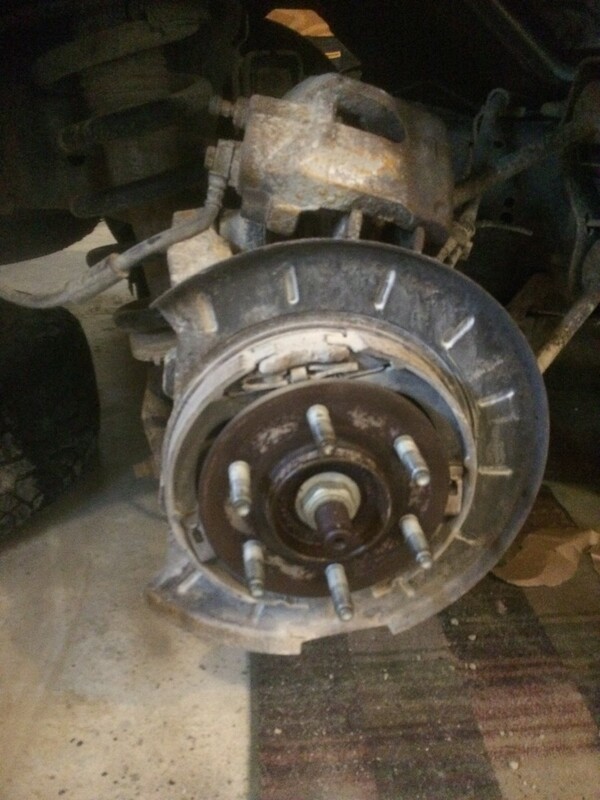 I took a look and concluded that the dealership had placed new pads and new tires on worn-out rotors, which just makes replacing the rotors more urgent. We decided this was a good opportunity to replace parts and get our vehicle up to top driving condition. 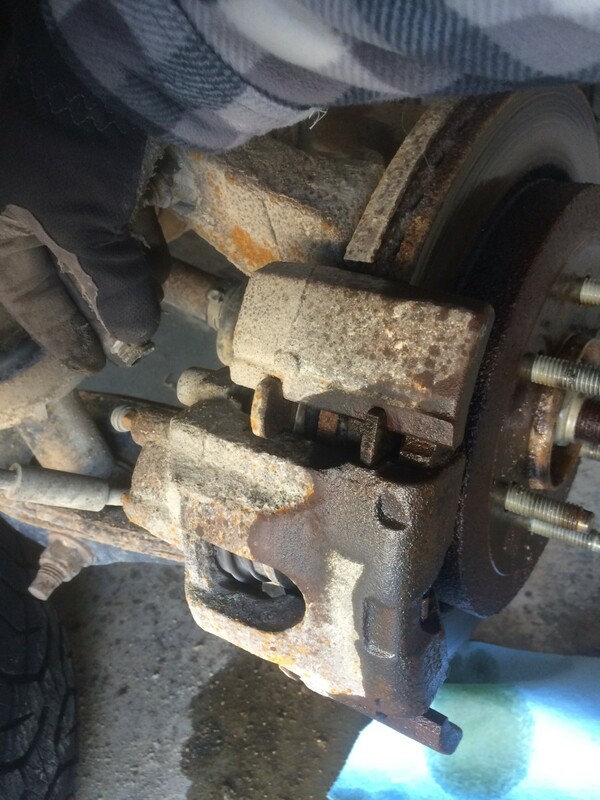 If pieces are scraping off or if the brakes are bad, it's time to get the brakes replaced. 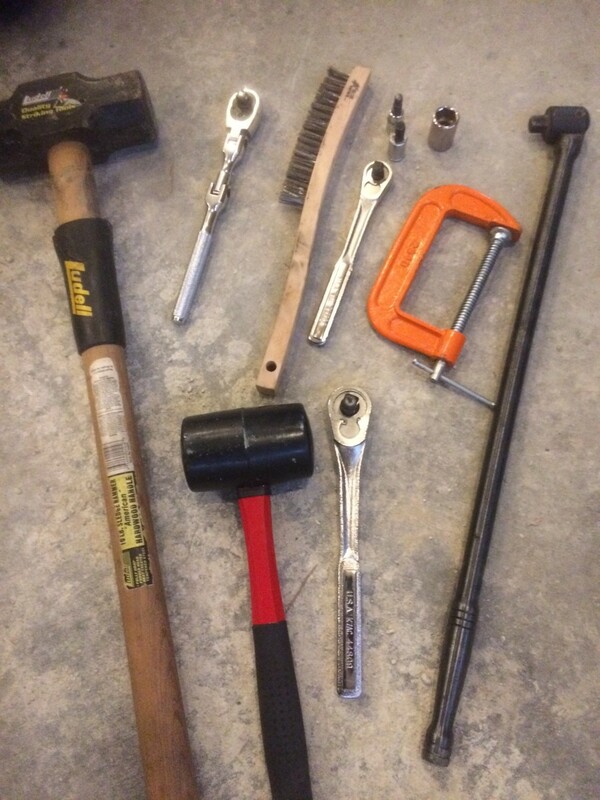 This isn't a lot of work if you have the right tools. If this is your first time, it may take an hour to complete the first wheel, but expect it to take about 20 minutes on the rest. Recommended tools to help you get the job done more easily. 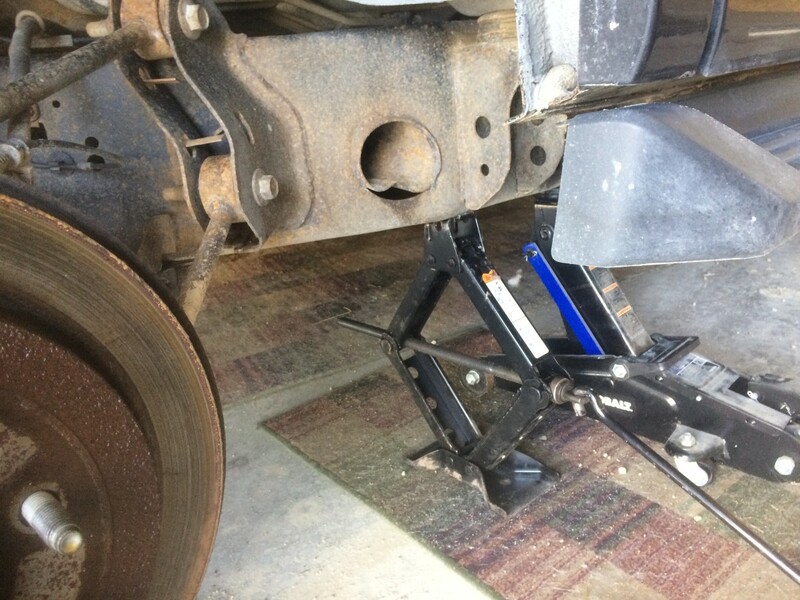 Your car may come with a jack, which works well enough, but for added security, a jack stand is recommended. Remove any rust (if necessary). Clean all the old and new parts. 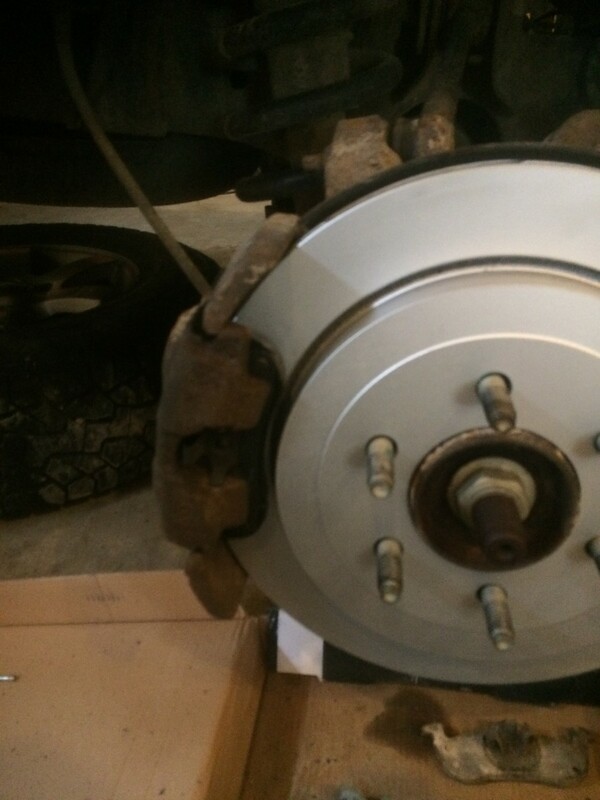 Install the new brake pads. Tighten the lug nuts again after 25 miles. I wouldn't recommend lifting the vehicle for any reason, but keep it on a level surface as the manual recommends. In this picture above, the jack that came with the car was used in addition to the jack we had, because the other jack was not able to lift the weight. The second jack was used for reasons of safety and slow dropping. We added blocks on the front and back of the other wheels in case the vehicle slid forward or backward. I've received many thoughts on having the parking brake on or off, but we left it off, hence the need for wheel blocks. 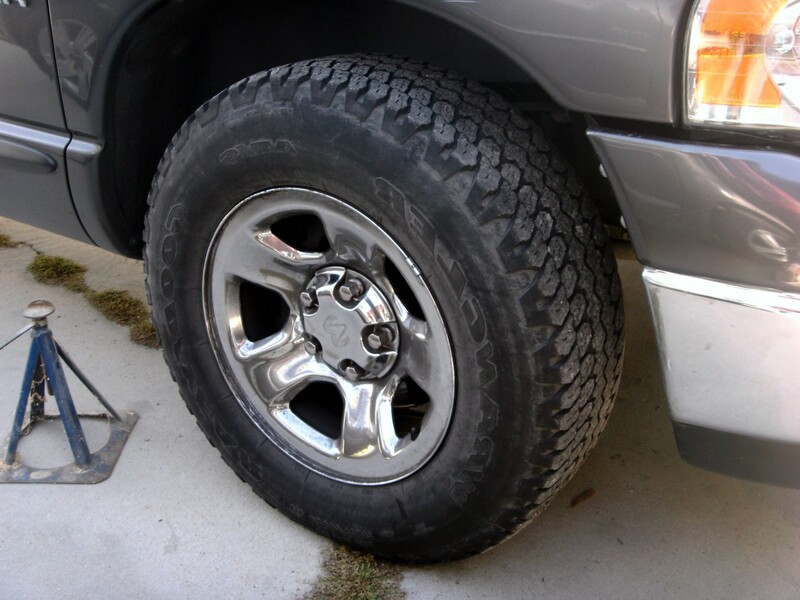 Keeping the vehicle in parking will keep the tires from turning more than 30 degrees. 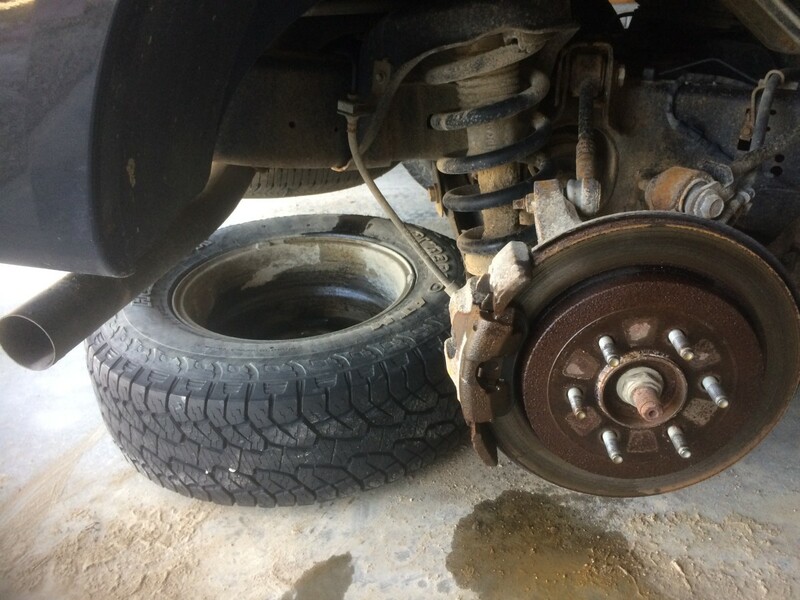 A good safety tip is to use the old tire as a spacer—just in case your jack fails and the car drops down. 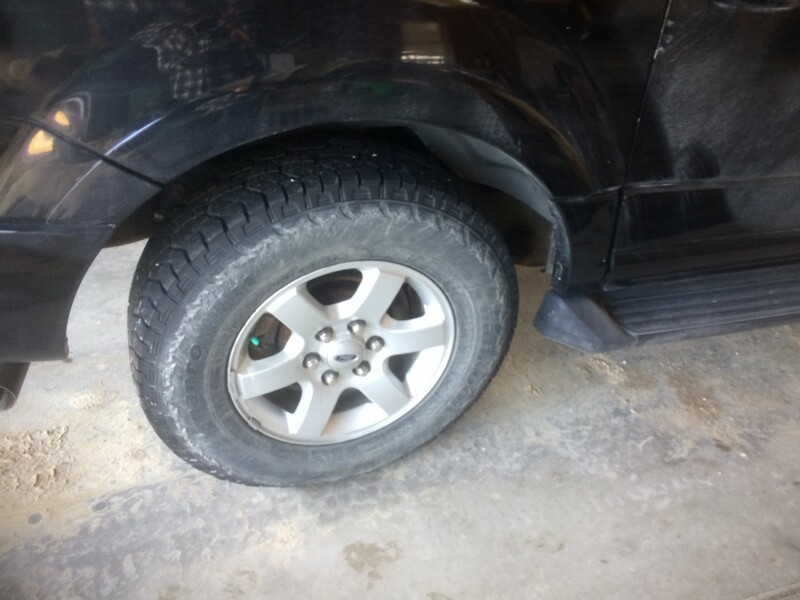 We used the included tire changing bar to remove the lug nuts and placed the tire under the vehicle as a safety precaution. 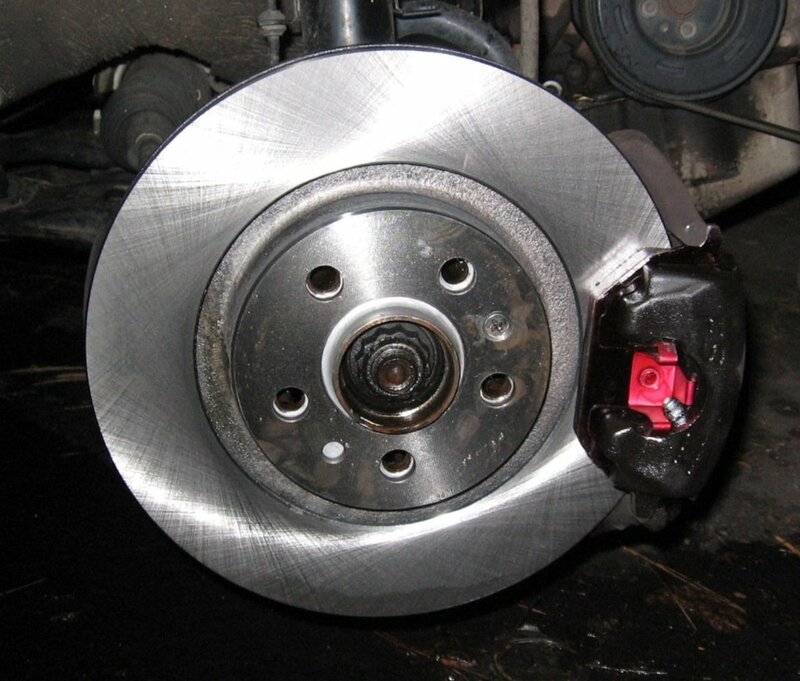 At this point, the brakes and rotors can be inspected and cleaned if necessary. On a couple of the wheels, after removing the lug nuts, it was very difficult to remove the tire. After spraying it with rust removal/liquid wrench, and waiting 10 minutes, it required some taps with our sledge hammer. 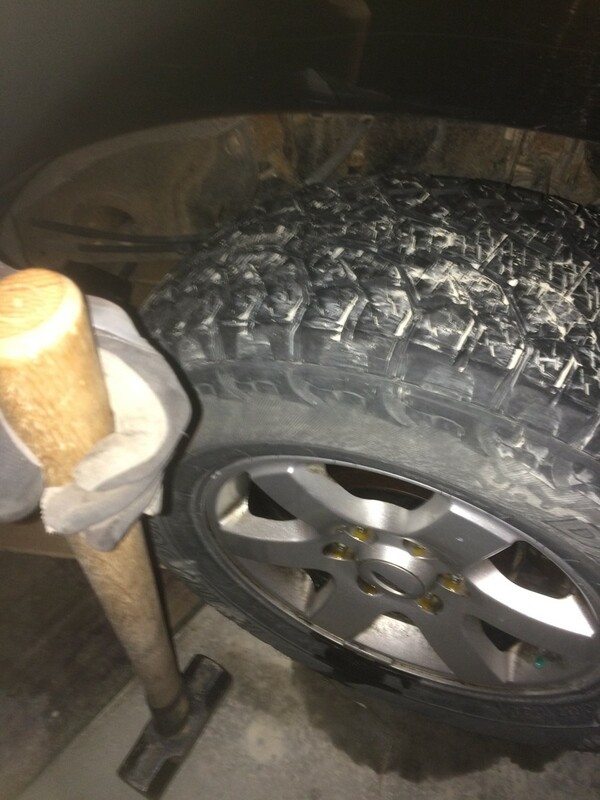 We let the weight of the sledge hammer move the tire off. It did require a tap on the cap and the tire together on each side, in a star pattern to finally get a couple of the tires to move, that means combined tapping them at the same time. 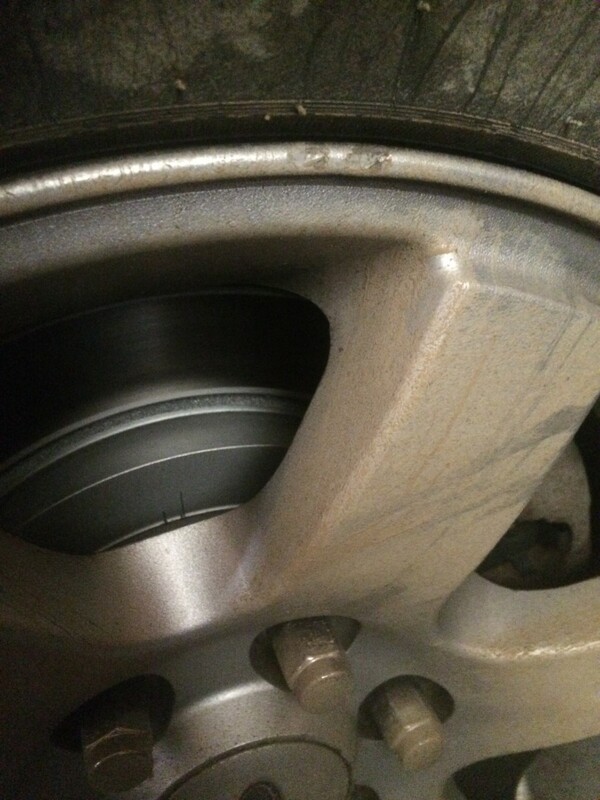 If you experience this same issue and need to use the sledge hammer, do not hit it too hard or hit the cap by itself as you'll risk warping the hub cap. 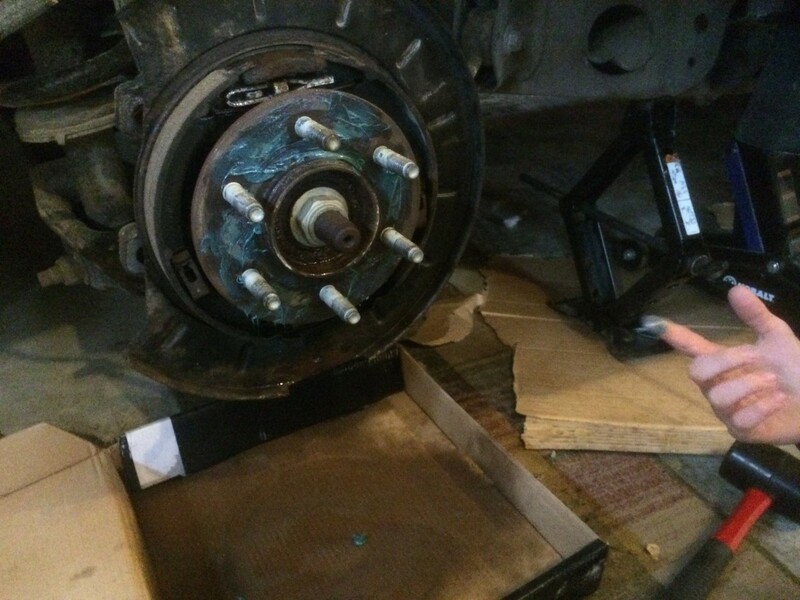 Removing a rusted rotor can be challenging. When you are ready to remove it, Spray the insides and tops of the rotor with the liquid wrench to loosen it up. The rotor has to be removed if it's in bad condition or has deep grooves. The rotor in this picture can't be turned (shaved down) and re-used, because its the sides are chipping off. 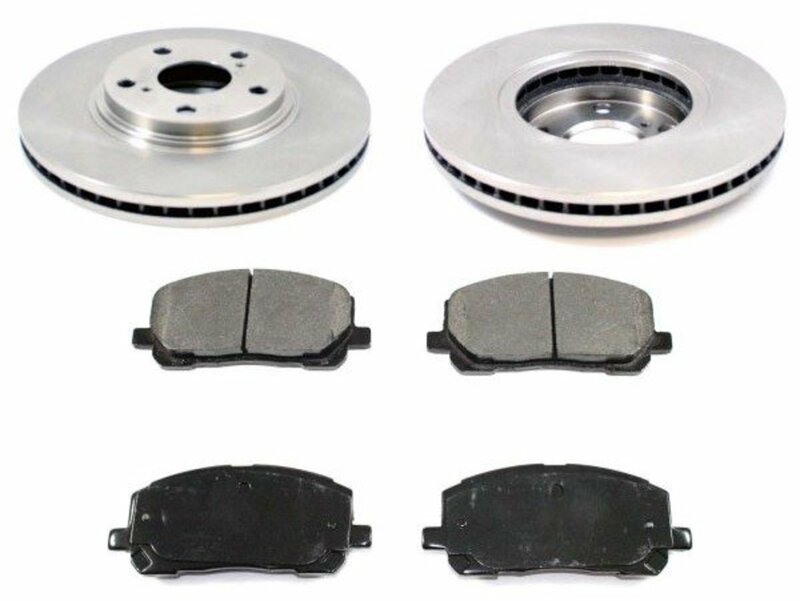 New rotors do quadruple the price of this job, so keep this in mind when considering to keep them after having them turned or replaced. Turning them will result in many trips to the store to have them turn each one. In most cases (not my case) the rotors can be cleaned and put back on. 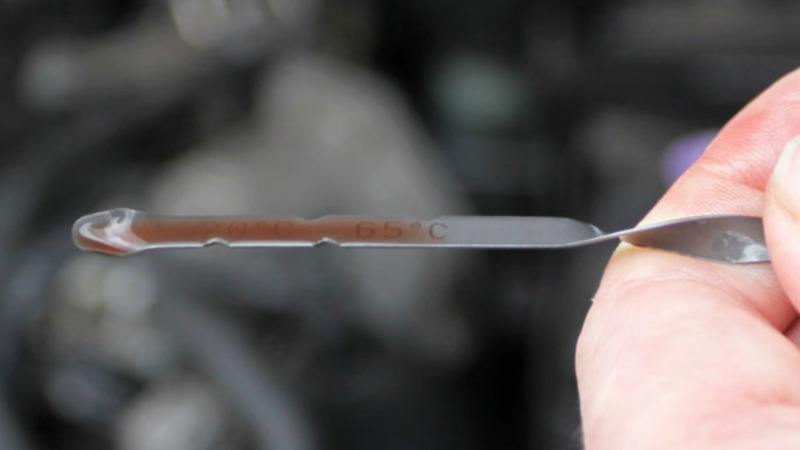 Be especially careful to replace a warped rotor, which will shake when driving. 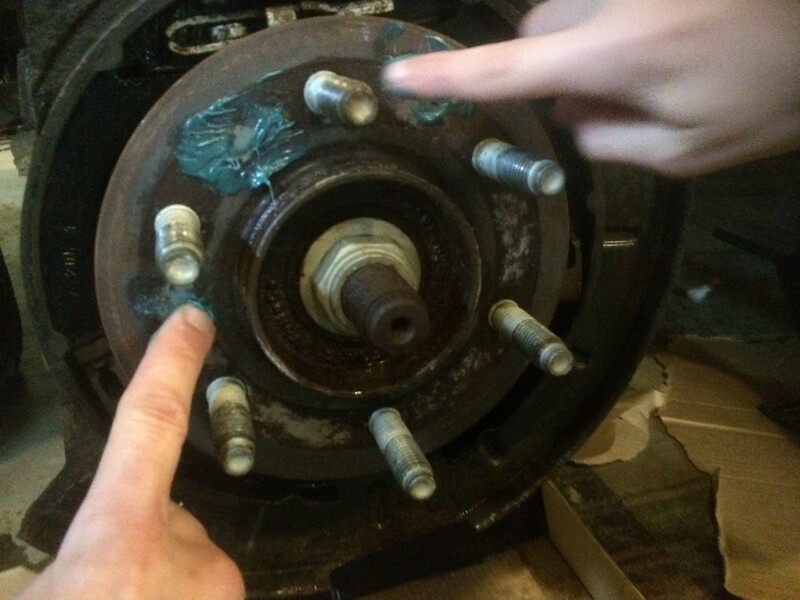 This is not to be confused with a wheel bearing issue ... the car shakes because the rotor will not be perfectly round. You'll need your Allen sockets. While I didn't need to use a screw driver to remove all of these caps on the brake caliper, I noticed some were missing and some were stuck on there. The brake kit I bought earlier had some replacement caps, which later determined the fate of the old ones. There's a bolt on the top of the caliper and on the bottom, which is keeping the brake pads snug to the rotor. 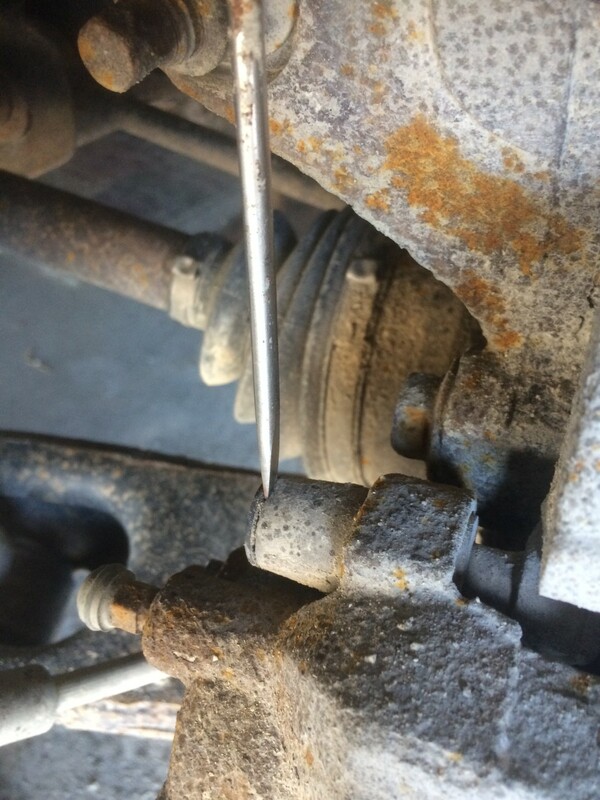 Remove these and pull the caliper off. 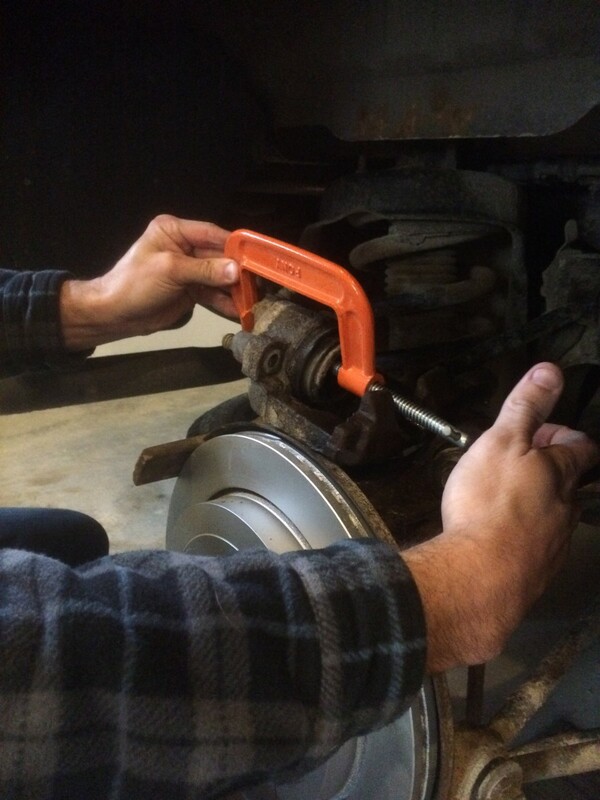 Use the rubber mallet to get the caliper out of its slot once those bolts are removed. It shouldn't take a lot to get it to pull out. On the rears, I only had to place the caliper on the top of the wheel settings. It didn't seem to cause any problems at all. The front caliper had to be hung using bungee cords, or I risked hurting the brake line. In this step, notice that the caliper bracing is still left on the left rear tire. 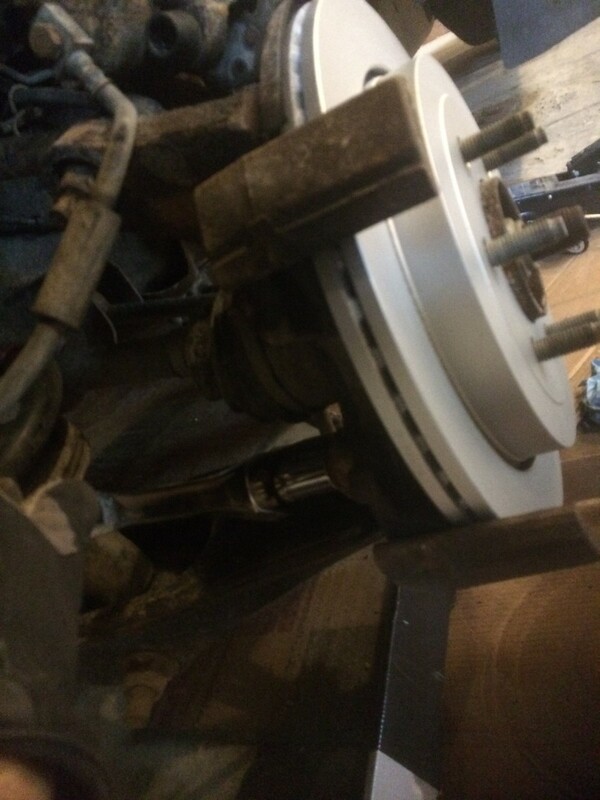 This bracing does not need to be removed on the rears, just on the fronts in order to remove the rotor. When removing the brace, be sure to use the 18 millimeter socket on the breaker bar. I spent a good hour trying to use a standard ratchet and socket on these braces, but after breaking my ratchet I went to the store and bought the breaker bar. It only took about a minute to get those two bolts off using the breaker bar; I just needed to make sure I had the socket snug on the two large bolts. 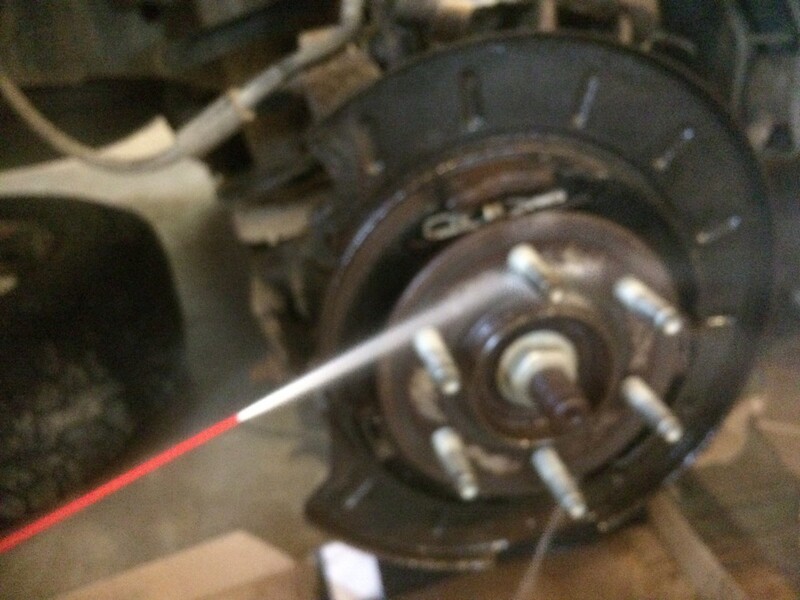 By this time, the liquid wrench had done what it could and it was time to remove the rotor itself. Since it was rusted on, I hit the rotor with the sledgehammer in a star shape, but not too hard, so as not to impact the alignment settings. It eventually separated and we we were able to pull it off. Here it is with the whole caliper and rotor off. 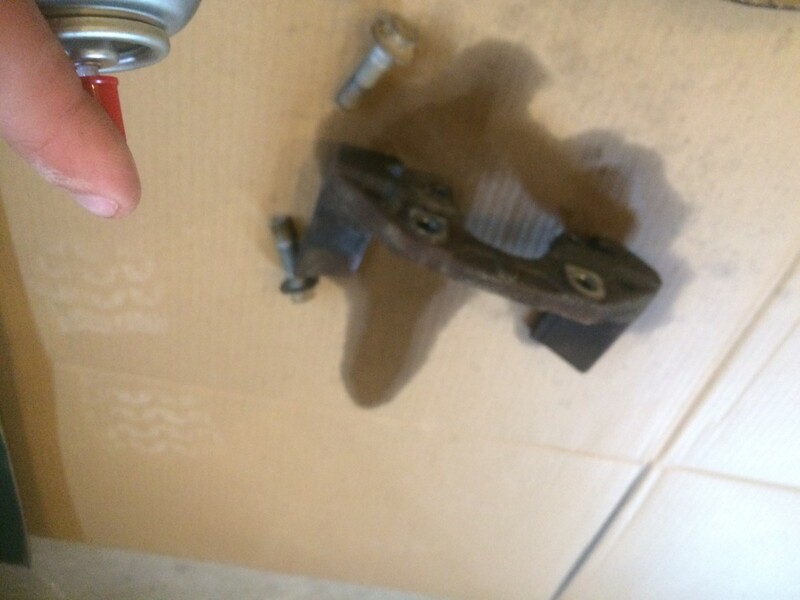 In this case, we proceeded to clean the parts with the brake spray and made sure all was good. 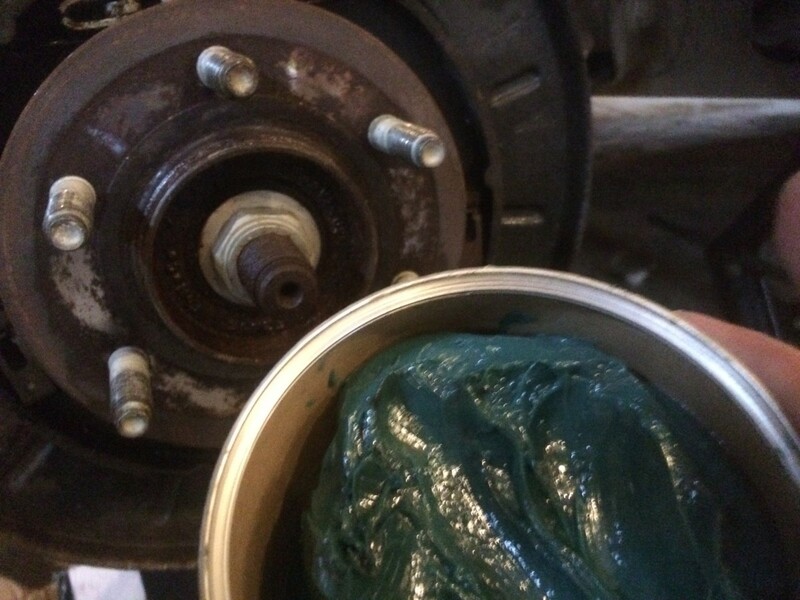 After cleaning it off, we began to add brake grease. 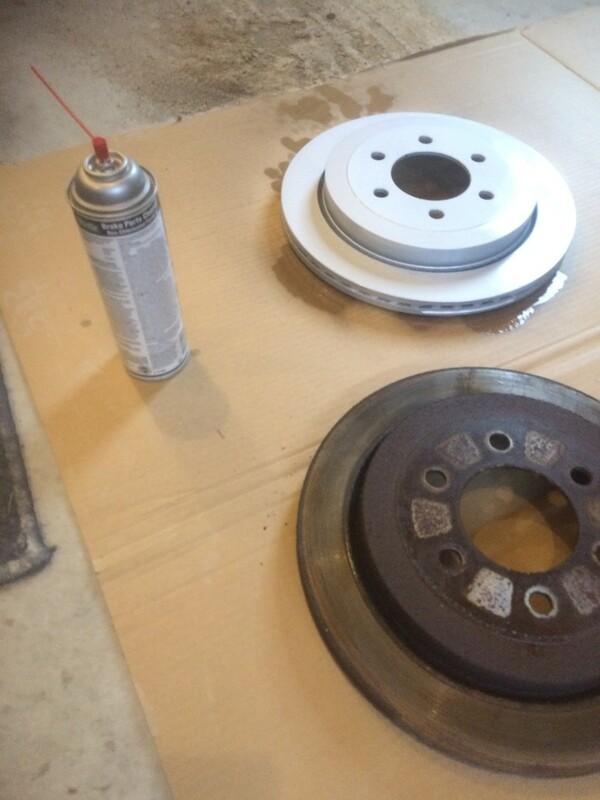 This will keep the brakes and rotors from getting too hot and prevent from further rusting. No better time to get the next generation to help and learn something new. I know what you're going to say, "The rotor looks clean to me". It needs to be sprayed down with the brake cleaner. Why? 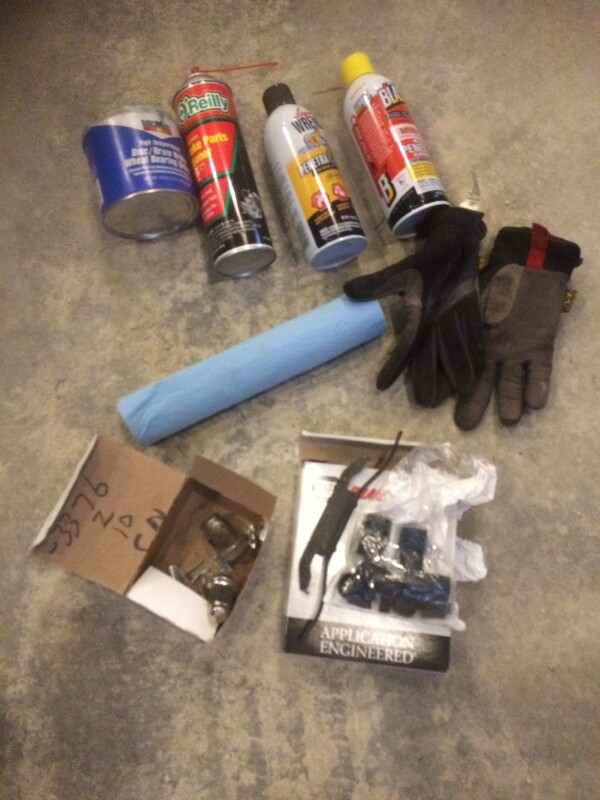 Your auto parts store is going to explain that these are oiled up during transport, so you'll need to spray them. Soon after spraying them down, we wiped them with the paper towels. At this point you may have a new, cleaned, or recently turned rotor. Place that back on as snug and tightly as possible and begin to put everything back together. Tighten the caliper brace back on (if it was removed, no need to remove on the rears unless you wire brush and clean it, which is what I ended up doing). 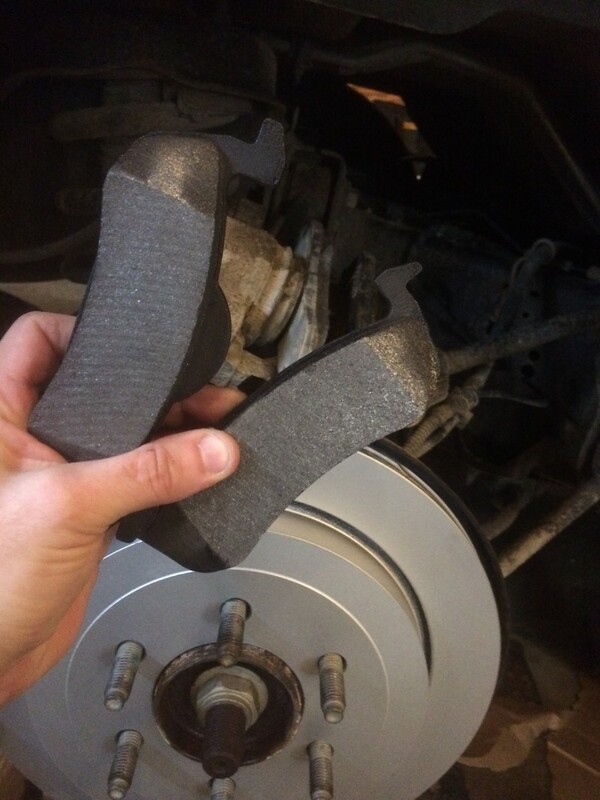 These didn't need to be replaced, but they were junk grade brake pads provided by a dealership. 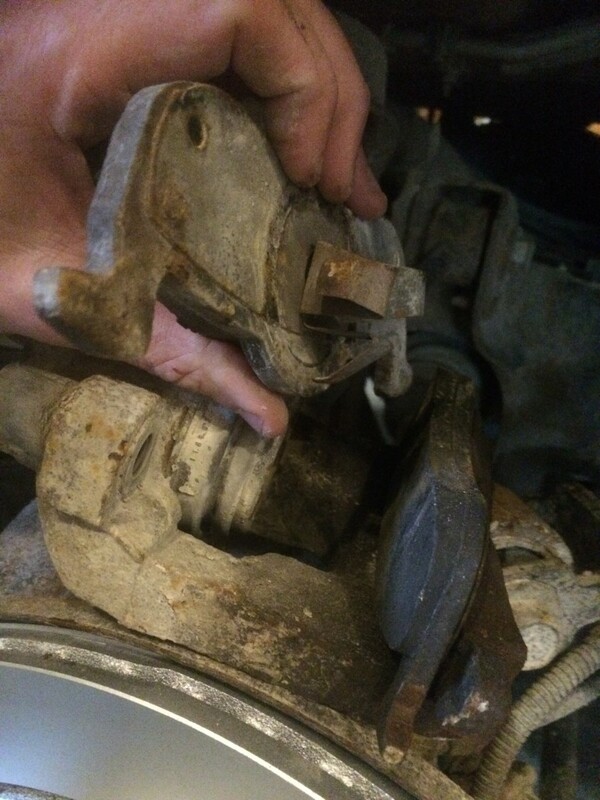 We could have re-used them, but brake pads aren't very expensive and if we were going to do the work, we thought might as well pay more money for a lasting pair. 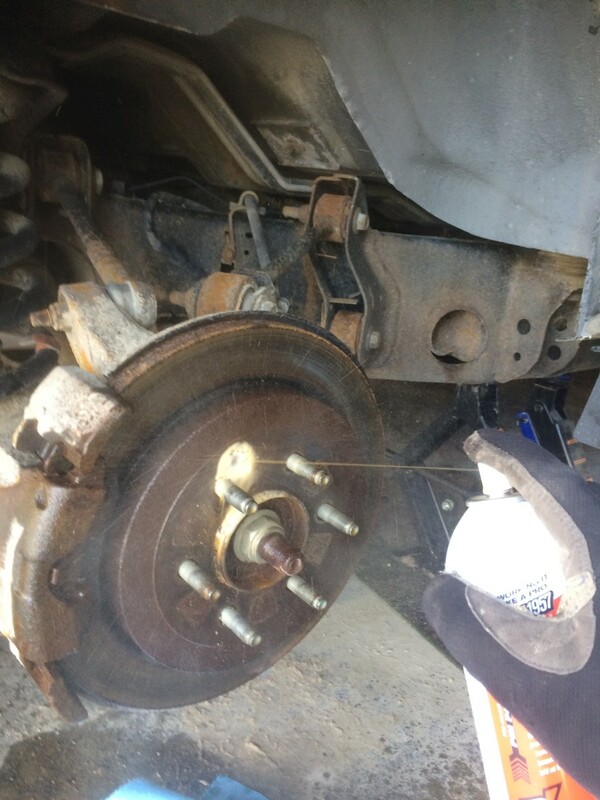 We began to clean the caliper once the brake pads were removed, using brake spray and the wire brush. It's likely you will need one spray can for each tire. You should try and use one for each so you know you've cleaned it thoroughly. 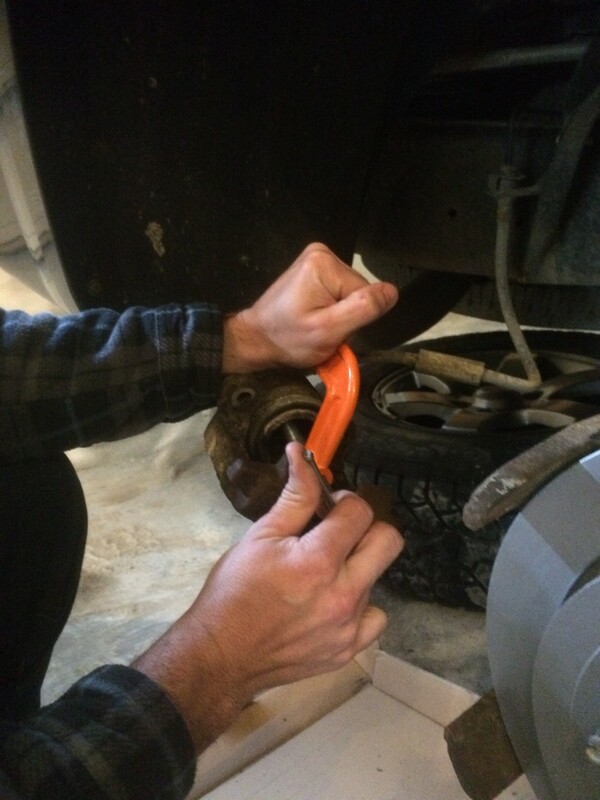 We used the C-Clamp to push in the caliper. 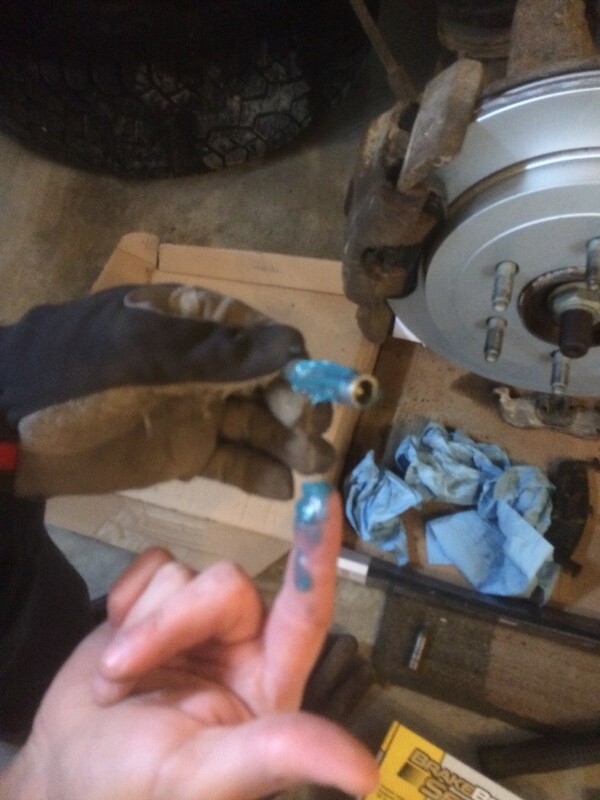 On our Toyotas, we would usually open the bleeder and allow it to drain out when pushing in the piston, being very careful to not allow any air back in. 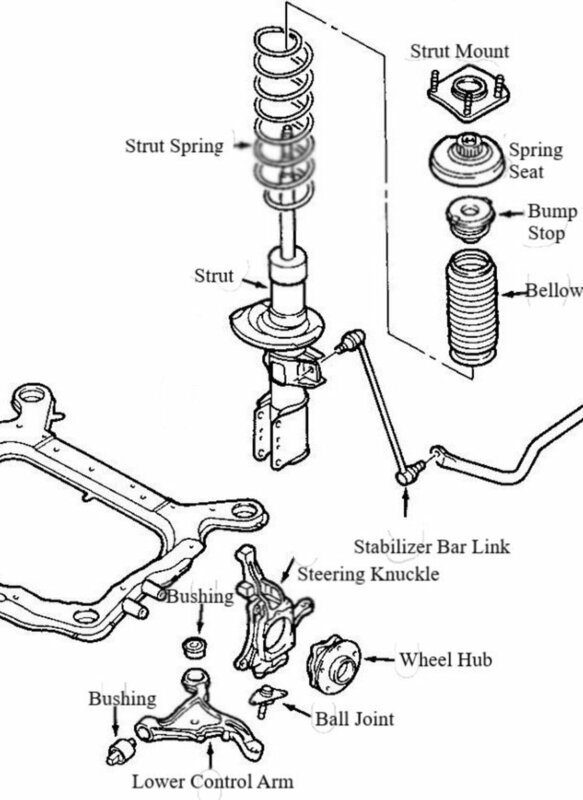 After talking it over with others who have the ABS system, it didn't seem to be necessary on our Fords as the brake line is part of that system and there is some risk to get air in those lines. You'll notice the brake pedal in the driver seat has dropped as soon as you push those pistons in. If you decide not to bleed the brakes, then plan to have the job done same day and test driven at the end of the day. Do not leave caliper pistons pushed in overnight. 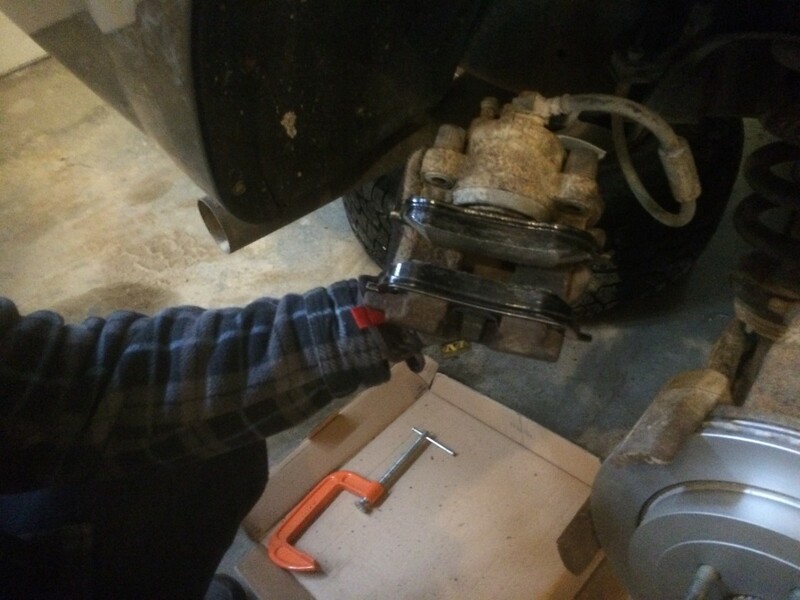 If you choose to take the cap off the bleeder and unscrew it before tightening in the piston, that's your choice, but you'll need to make sure someone is gently pumping the fluid through by stepping on the brake pedal when ready to tighten it. The brake fluid needs to make it's way through this line and onto the brakes without air or gaps within the line. It might depend on the condition of the vehicle, mine was not bled and wasn't difficult to push in, the brake pedal was nice and tight at the end of the job, but if the brake piston is giving you resistance when using the clamp, you might consider opening the bleeder and placing a bowl underneath it to drain (remembering to refill the brake fluid at the end of the job). 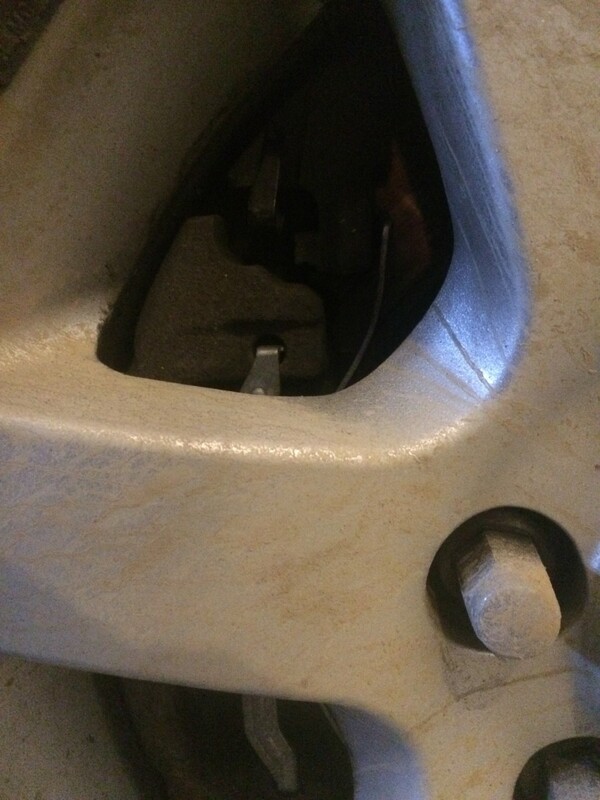 Once the piston is in, place the new brake pads into their respected slots. 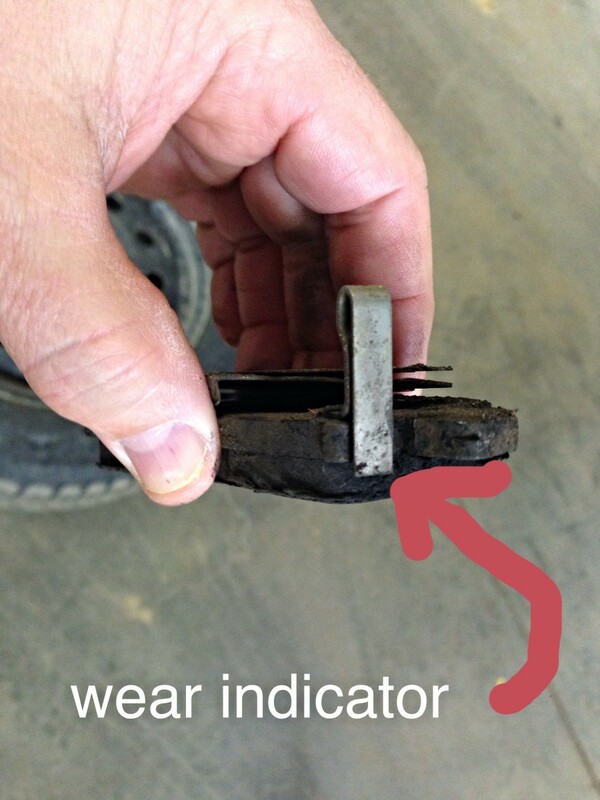 Please note that the brake pad with the hump goes on the piston, whereas the brake without the hump goes out. 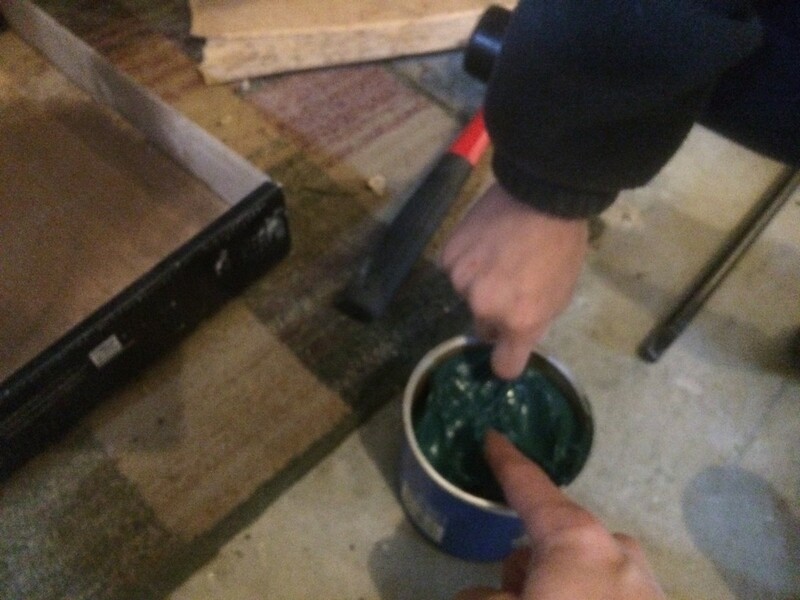 This is very important when placing the caliper back on. On the fronts, there are clips and covering on each brake pad. Be sure to place those back on or replace them entirely. The additional parts kit I got had new clips and metal coverings that I replaced. I'm more familiar with greasing the piston bolts that attach the caliper back on the rotor, so as a precaution I greased those. Any place metal contacts metal and shouldn't stick or rust together is a good place to put grease. In this case, if the tire goes flat on the highway and needs to be replaced, the person can easily remove the tire and place the spare on. 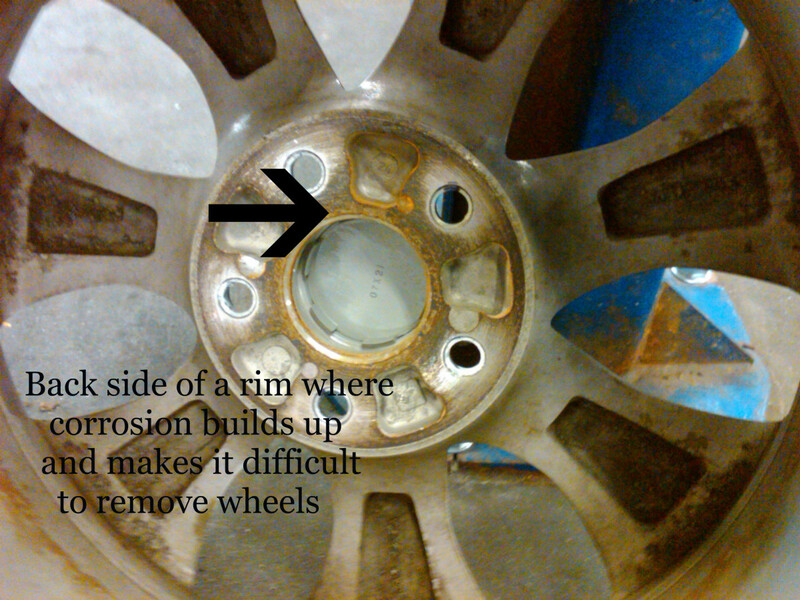 Keeping this in mind, place grease on the inside of the rotor where the tire metal meets the rotor. Not too much grease, as it needs to be on there as tightly as possible. 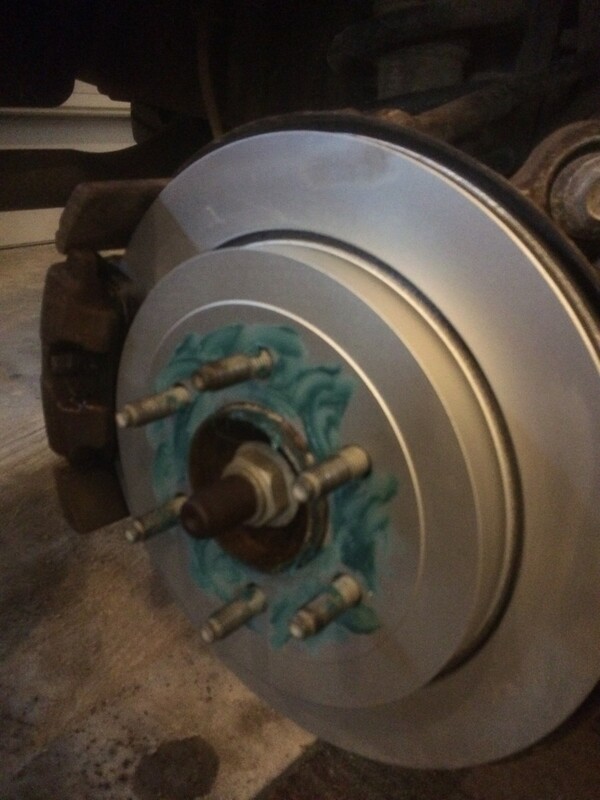 See these dreadful rotors? 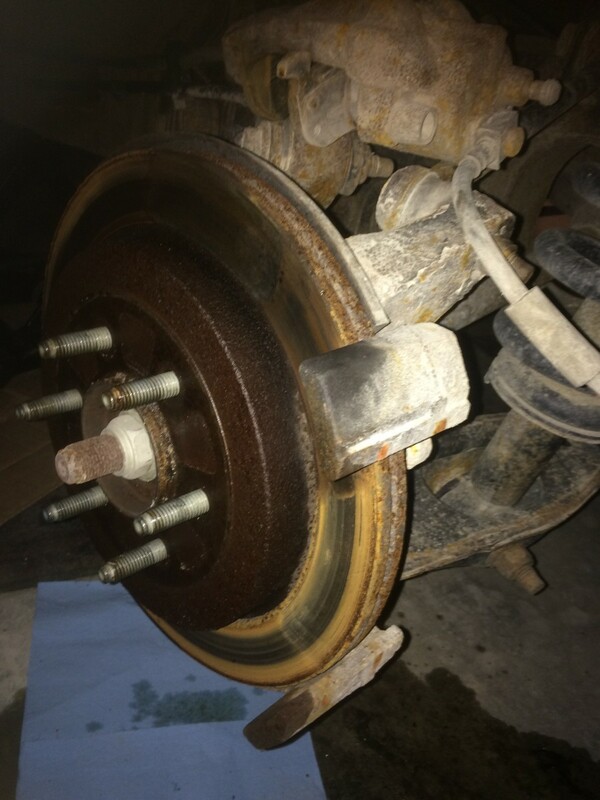 The brake pads were running on an uneven rusted surface. 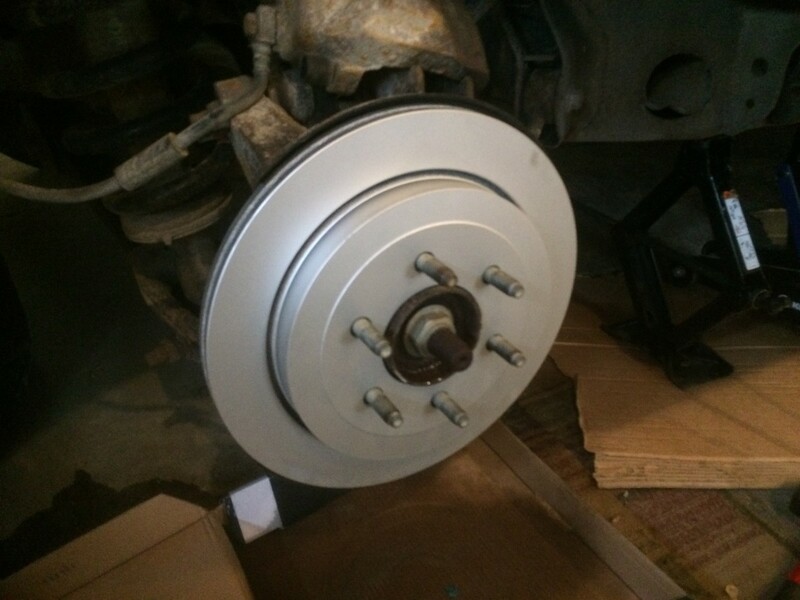 Now you'll see these great looking rotors on the front and back. It felt a world of a difference when driving away. However, there's still one more important task, perhaps the single most important step before going back on the road again: Test drive and tighten. If you get your tires rotated, the manufacturer always recommend the lug nuts get tightened 25 miles following tire removal. 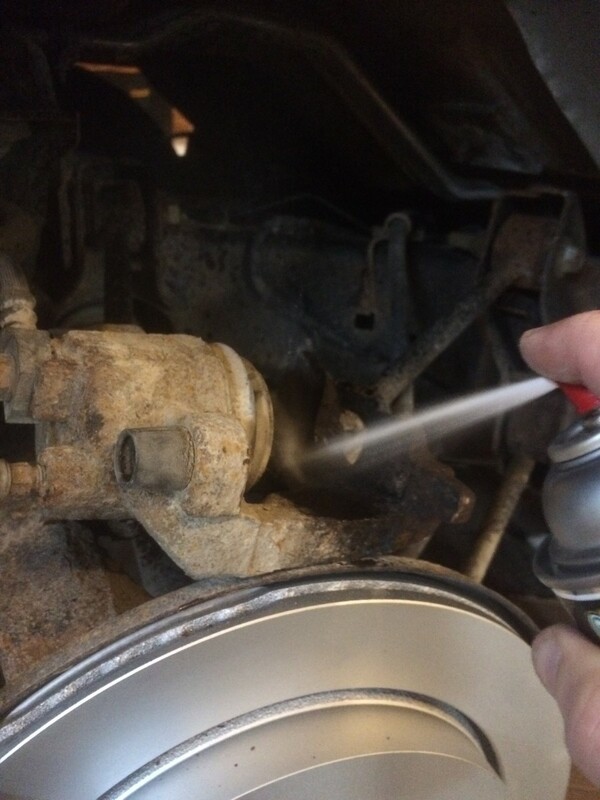 This is especially important as you've replaced rotors underneath the tires. Tighten them very good, go for a test drive. Once the vehicle make it's first trip, be sure to tighten at the next stop when you've estimated 25 miles has been reached. 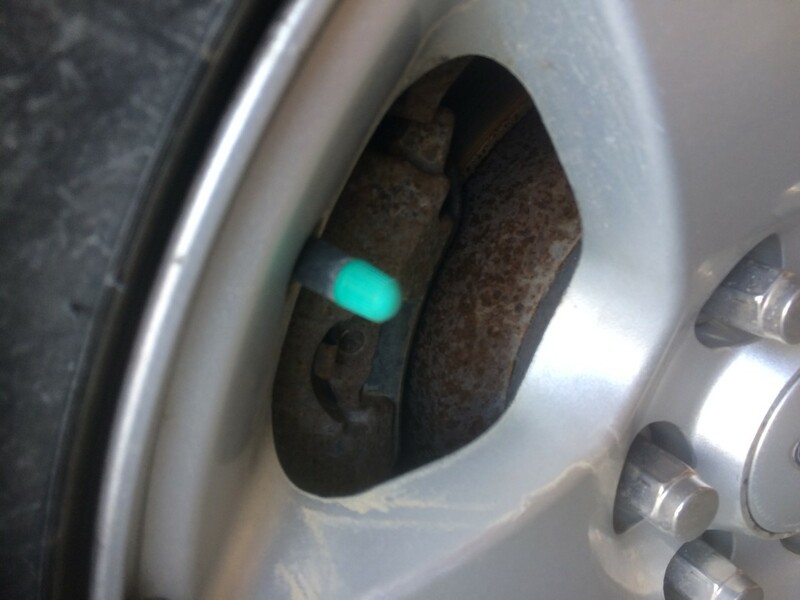 In the case of this vehicle, all the lug nuts were replaced. 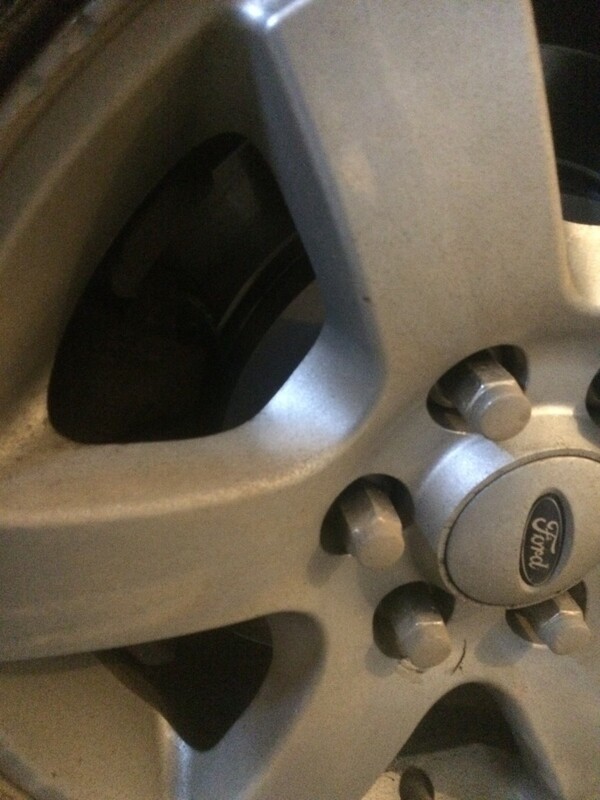 If any lug nuts feel loose or move in any way, they need to be replaced. We hope this guide proves helpful and provides you lots of support on your adventure. 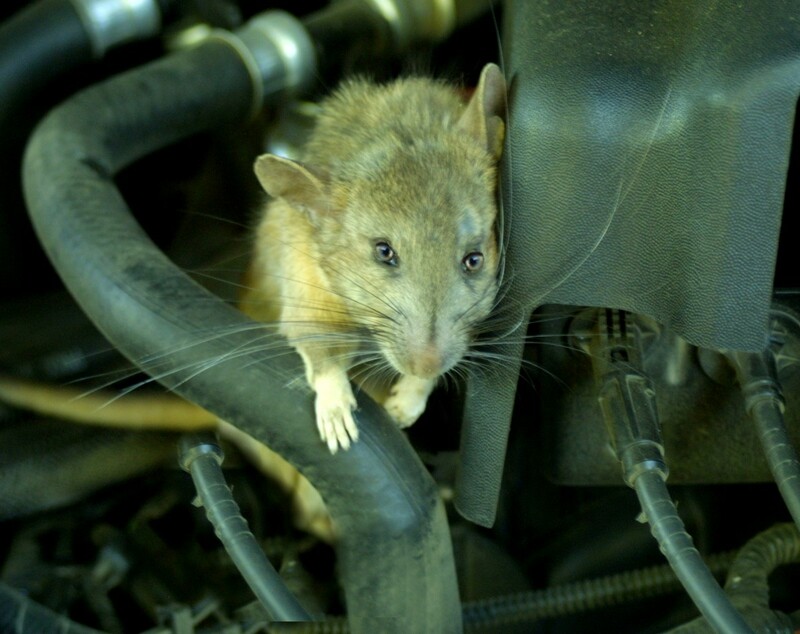 Please see some of my other articles about oil changes and spark plugs, which are typical maintenance requirements on high mileage and/or used vehicles.